Slice spaghetti squash in half lengthwise. Scoop out the seeds with a spoon and clean as you would a pumpkin. Completely submerge 1 half at a time, in a large pot of boiling water and cook for about 20 minutes until the inside is just tender to a fork and pulls apart in strands. (Cook’s Note: It is better to undercook if you’re not sure.) Remove, drain and cool with cold water or ice bath to stop the cooking. Melt half the butter in a medium saucepan over medium-high heat. Add cream and reduce for about 2 minutes, then add garlic and cheese and whisk quickly, heating through. Stir in the rest of the butter and parsley. 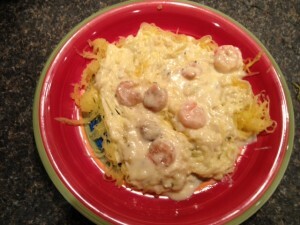 Place spaghetti squash in a large serving bowl, and pour Alfredo sauce over squash. Garnish with basil and tomatoes. Serve and enjoy! This recipe is from the Food Network and is on my list of things to try. I’ll add a picture when I make it. I tried the recipe and it turned out to be one of the best dishes I’ve eaten so far. I skipped the tomatoes and didn’t miss them. Read my blog about the cooking experience.